I was going through a pile of old work, mostly rougher stuff from when I first started painting that had small glimpses of promise but lacked real spark or cohesiveness in the way they came together, when I came across this piece from 1994. It’s about 12″ by 16″ on rough Arches watercolor paper and has the words Bradford County written in pencil at the bottom corner of the paper. It’s a piece that I always found attractive but seeing it really brought me to a stop. I so recognized that time when it was painted and could now see several potential directions where my work might have headed other than the one it eventually followed. 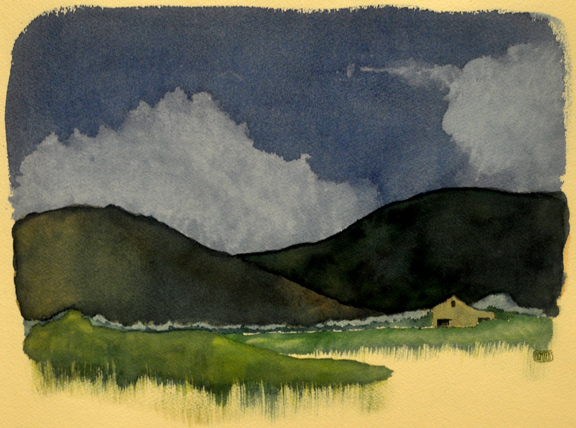 This piece was very much in a more traditional watercolor style, with no treatment of the paper and the colors pure. The colors had not yet come around to the palette that I later adopted. For instance, the sky is a single uncomplicated shade of blue. There are no other colors, not even other blues in it. I had yet to make the move to more complex colors even though there is a hint of it in the foreground and the hills. It also is a depiction of a real place, as denoted by the Bradford County. Growing up, we lived on Wilawana Road just a few short miles from the NY/PA border and if you followed the road into PA you found yourself in Bradford County. That part of the border is at the base of steep hills and is filled with rural valleys that I spent many hours exploring. This scene was purely based on that place even though it is not any one location there. I had not yet made the leap into creating my own landscape, forming the felt space rather than real space of Ralph Fasanella that I had mentioned in an earlier post. To me, this is a time capsule that takes me back to the time when I painted it. It suggests potentials that seem a million miles away from where I finally landed at the present. It shows the possibility of staying strictly as a traditonal watercolorist or painting solely as painter of reality. A depicter of the what is with the proper colors and forms. I wonder how my work might look today, how it might differ, if I had followed any of those other possible routes for the work? I suppose many of us can look back at certain points in our lives and see times much like the one captured for me in this simple painting, times when we are at a junction in our lives and must decide which path to follow. I’m sure some of us would look at such a time with a certain level of regret but for me, I am happy with my decisions made at and after the point of this painting so for me this is a warm memory, a reminder of the path I was about to follow. Just think – if you’d kept heading south, you might have ended up in Darlington County! How’s that for free association? That is interesting. Springsteen has referred to his music in cinematic terminology before, calling his songs “sound pictures” that are meant to evoke place. Thanks for that connection!